Yellow rattle or cockscomb, Rhinanthus minor, parasitic on grass so very useful in a wildflower meadow to reduce the vigour of the grass, allowing the wildflowers more space. It is native to Europe and Western Asia. Notoriously difficult to germinate from bought seed because it is not viable very long at all, so I sow my own freshly collected seed straight onto pots of grass in autumn, and by spring they sprout in little clumps in the pot, which will be sent out as they are and should be planted with the grass they come with as host. annual plant that gains some of its nutrients from the roots of neighbouring plants. It grows to 25–50 cm tall, with opposite, simple leaves, with a serrated margin. The flowers are yellow, produced on a terminal raceme. The fruit is a dry capsule, which contain loose, rattling seeds when ripe; the plant's name refers to these. Its preferred habitat is dry fields or meadows, where its flowering period is between June and September. InIreland and Scotland, this species is often associated with Machair habitat. 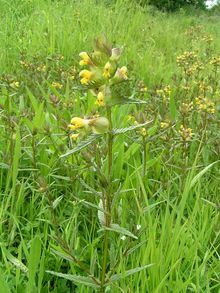 Research at the UK's Centre for Ecology and Hydrology has shown that encouraging yellow rattle to grow in hay meadows greatly increases biodiversity by restricting grass growth and thereby allowing other species to thrive. The seeds can be spread effectively by traditional hay-making practices.